I think the most fundamental question you can ask in Krav Maga is “When do I use it?” You’ve got the skills, you have sweated through training, so with a bit of luck you ought to be able to defend yourself in most self-defense situations. When confronted with one of an infinite variety of attacks, by countless types of attackers, in an infinite variety of settings and situations — when do you use Krav Maga? I’ve read in many books and articles that you first should run. Don’t be a hero. If you have the opportunity, use it. Run faster than you’ve ever run before and don’t stop until you are a million miles from danger. The next choice if running is not an option should be to grab a weapon — a stick, chair, phone, can of Red Bull, whatever — and bash the attacker. It is only after all else fails that you should use your Krav Maga skills to defend yourself. On the other hand, I have also heard more than once that, when faced with an attack, you don’t think, you immediately strike back. For instance, let’s say you’re in a bar and someone pushes you from behind or tries to get you into a full nelson. You wouldn’t hesitate — you’d go from zero to a hundred in an instant. Does striking immediately and without hesitation counter the other advice of running away? Can I run somewhere? No! Is there anything on hand to counter, deflect, or neutralize the threat (a stick, board, etc.)? Nope! Time to defend the attack! What attack is appropriate? Overhead Stick Defense! What this means is that your first three steps need to be as fast as possible to get your brain to that last step as quickly as you can. You have to be able to Perceive, Analyze, and Formulate at lightning speed! Easier said than done because when you add to it the stress you are under when your body does a full-on adrenaline dump in step 2, you are in pretty bad predicament to start with. How can we speed this up? Hard training. As helpful as Krav Maga DVDs and books can be for refreshing yourself on certain concepts and techniques there is no substitute for training hard, under stress, and in a group setting. Training hard exercises not only your body but also your brain by closely simulating these kinds of situations. 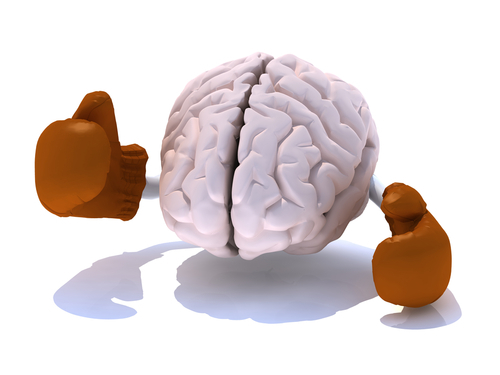 The more you train, the better and faster your brain becomes. It is within these training sessions, dripping in sweat, exhausted, stressed, and hopped up on adrenaline, that you really forge the reactions you need to save your life and get you through this brain cycle and away to safety. Think fast and stay safe!